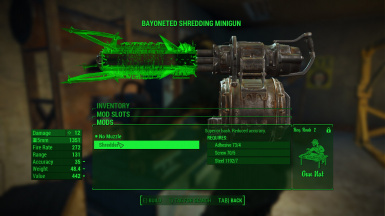 A painstakingly done overhaul of RANGED PLAYER AND NPC WEAPONS in Fallout 4, all DLCs included. AWKCR compatible and required. Title Art generously provided by LucidAPs, big thanks! - Damage of Plasma Gun Flamer Barrel now only affected by Heavy Weapons perk, thank you riloki for your kind suggestions! - Fixed minigun accelerated barrel description/effect mismatch. Thanks Prodigy152 for pointing this out! - Fixed Radium Rifle Advanced Receiver rate of fire. Thanks Morchaste for pointing this out! A vast number of weapons and NPC weapons now has realistic projectile speed, as well as gravity effects. 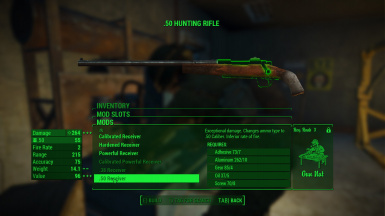 - Weapon weights now use empty weights in game: when I did the weight overhaul it was before Beth created survival mode, so I made the weapons in game having loaded weights or weights with ammo in magazines. Since the introduction of survival mode, ammo has weights and it's only fair to use empty weight now so not to eat into player's precious carry weight limit. Many thanks for jakelad for enlightening the way! - Compensators now have smaller muzzle rise but bigger spread than muzzle brakes, as they should be, thanks jakelad again for bringing this one up! This patch is meant to WORK WITH WOF NORMAL BULLET SPEED VERSION ONLY, it will NOT WORK WITH its REDUCED BULLET SPEED VERSION. - Added Broadsider, Combat Shotgun, Double Barrel Shotgun, Flare Gun, Fatman, Harpoon Gun, Junk Jet, Missile Launcher, Railway Rifle and Syringe Gun, all with recalculated realistic projectile speed, some of them requires new skills to aim, so try them out! - Different weapons now have more distinc characteristics regarding hit spread, recoil and accuracy. Energy weapons are most accurate, some ballistic weapons are more accurate than others, pipe weapons are simply bad, and junk jets...don't count on them... Test out your weapons in game! - Shaved some weights from Hunting Rifles, thanks jakelad for your kind suggestions! 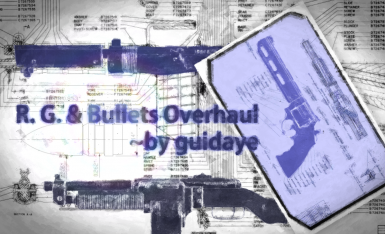 - Added Broadsider, Combat Shotgun, Double Barrel Shotgun, Fatman, Harpoon Gun, Junk Jet, Missile Launcher, Railway Rifle and Syringe Gun, all with recalculated realistic projectile speed, some of them requires new skills to aim, so try them out! - Added Broadsider, Combat Shotgun, Double Barrel Shotgun, Fatman, Harpoon Gun, Junk Jet, Missile Launcher, Railway Rifle and Syringe Gun, all with recalculated realistic projectile speed, some of them requires new skill to aim, so try them out! 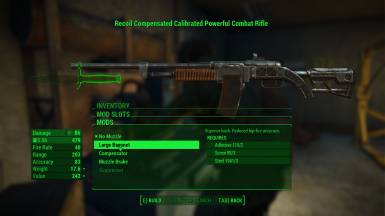 A compatibility patch for Classic Assault Rifle - Additions for Z06Frank's G3 mod by Giggityninja and Z06Frank, http://www.nexusmods.com/fallout4/mods/14248/? This is a compatibility patch for Weapon of Fate (Ballistics Overhaul) 1.2.0 by Seb263, http://www.nexusmods.com/fallout4/mods/12986/? Many thanks to the kind contribution of argvminusone, NexusFiles and Kmieciu in making of this update! Many thanks to the kind contribution of SilvasRuin, XarathosHawke and Norr in making of this update! Many thanks to the kind suggestion of SilvasRuin and Norr, without them this mod would not have been possible! - Reduced suppressed sound levels of Pipe Guns, Pipe Revolvers, Combat Rifles and Submachine Guns, hopeful this in turn would reduce the NPC detection range related to firing of these guns with suppressors. Thanks NexusFiles for your kind suggestions! In real life muzzle energy changes with barrel length, shorter barrels reduce muzzle energy, and this will translate into in-game damage reduction. Different ammo type has different muzzle energy fall-off rate, rifles rounds are affected more than pistol rounds with shortened barrels, this Update added these changes with reference of real life data. And because the difference of muzzle energy fall-off rate, Combat Rifles, Hunting Rifles and Pipe Bolt-action Guns can no longer have .38/.357 Receivers (or their damage output would have wrong calculations with shorter barrels), they now have Advanced Receivers instead. To understand Action Point, let's first look at what is an "action": an action is a sequence of following: aim at target, fire a round of bullet, (or a burst of bullets), and then reposition the gun to aim, so this sequence can be repeated. Therefore, Action Point is related to how much time it would take to complete one cycle of the above sequence. - Removed range penalty of Bayonets, Compensators, Muzzle Brakes and Silencers: they now, instead, have small hip-fire penalty added. Thanks TriNova for your kind suggestions! Thanks to VampriruM for this idea! 4. Turrets that fires 10mm rounds now have damage changed from 10 to 16 (same as 10mm auto-receiver in this mod), and its more powerful version from 15 to 25 (same as 10mm powerful auto-receiver). They are more deadly now so beware! - Boosted Institute Laser Guns base damage to 30 (vanilla 21), but reduced its fire rate and range. Finally, thanks to all! Please lets me know if you find abnormalities or any unreasonable values in this mod!